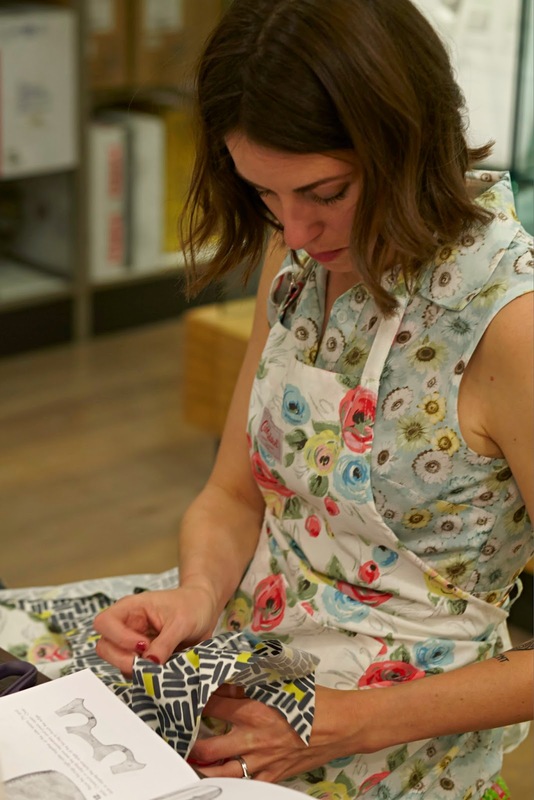 Just over a week ago, I was lucky enough to take part in a mini 'Sewing Bee' at John Lewis' flagship store on Oxford Street to help celebrate the store's 150th anniversary. 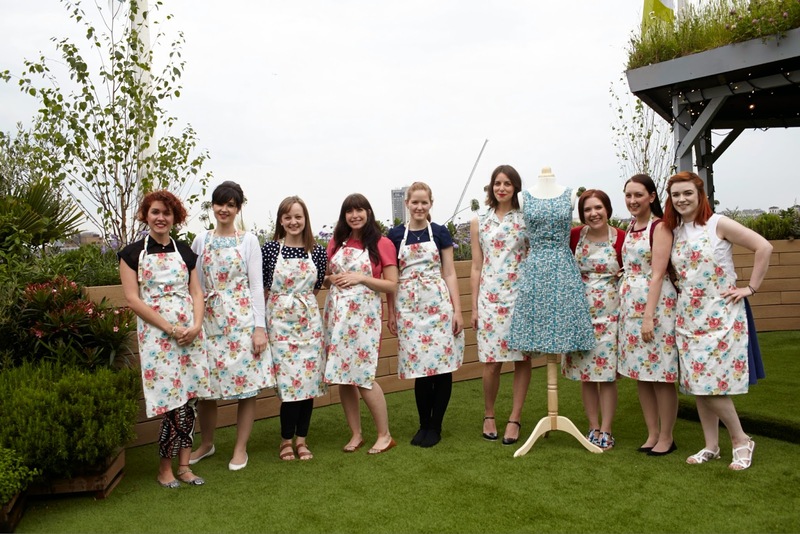 Run by the lovely Lisa Comfort from Sew Over It, the goal was to use fabric from John Lewis' special anniversary edition prints and aim to make a dress in a day. 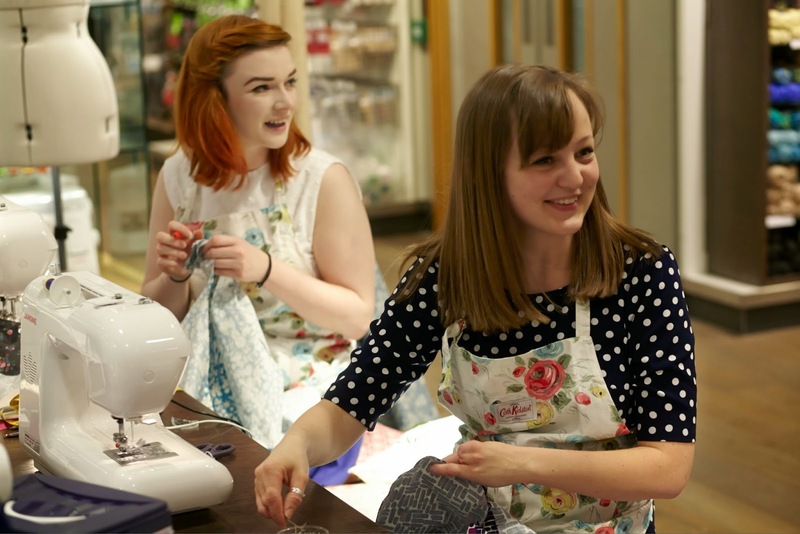 I was so excited to take part, especially after finding out that fellow Spoolettes, Roisin, Fiona, Amy and Emmie, would be sewing alongside me. I am also so thankful for having the opportunity to get to know bloggers Elena and Charlie. Saturday's do not get better than this y'all. 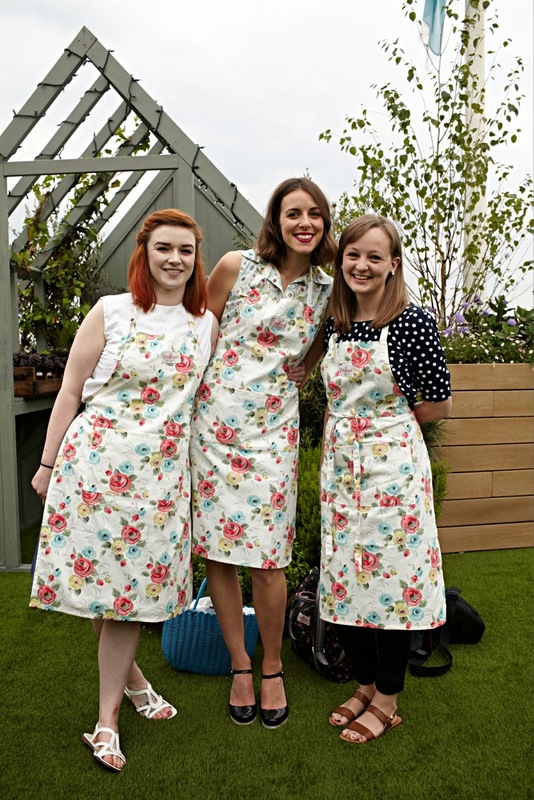 On arrival, after gushing at our gift of sewing box, scissors and Cath Kidston apron (John Lewis, you spoil us! 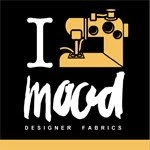 ), we were asked to choose our fabric and pattern. From the samples sent out to us a few days prior to the event, I knew straight away I wanted to choose the 'bricks' fabric in the grey and yellow, which looks like this. For my pattern, I settled on Sew Over It's 'Betty' pattern. 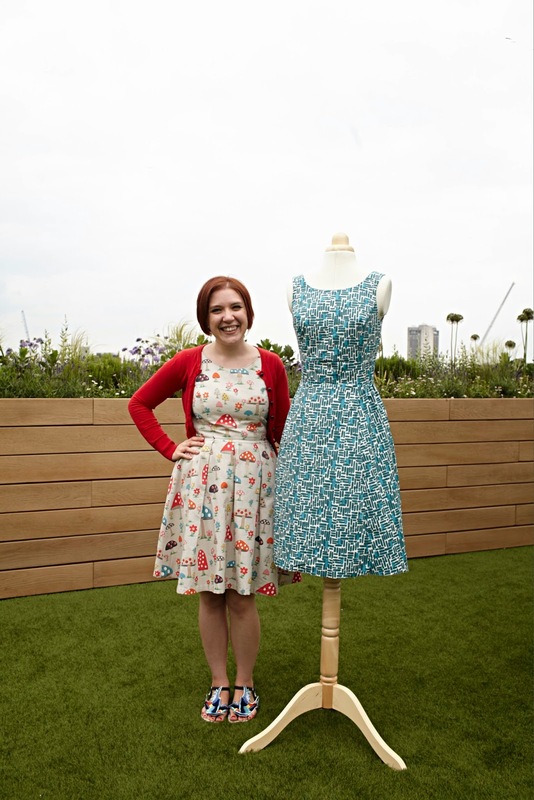 It's a very cute retro dress featuring a fitted bodice with dipped back and full circle skirt. Considering that the fabric is a reproduced 1950s print, I considered this would a perfect pairing. Pictures of the finished dress are at the end of this post! I think I can speak for the other girls in saying this day was a total blast. 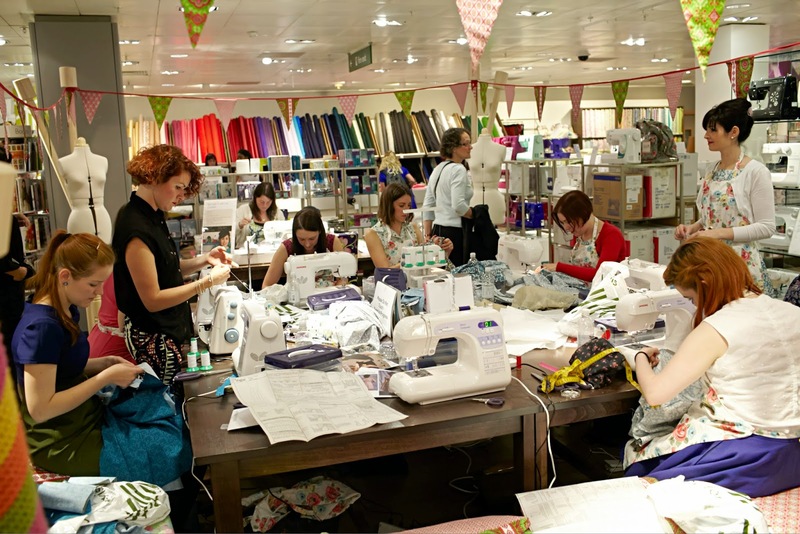 From start to finish, we had such fun sewing together, helping each other fit the dresses and playing on the fun sewing machines. 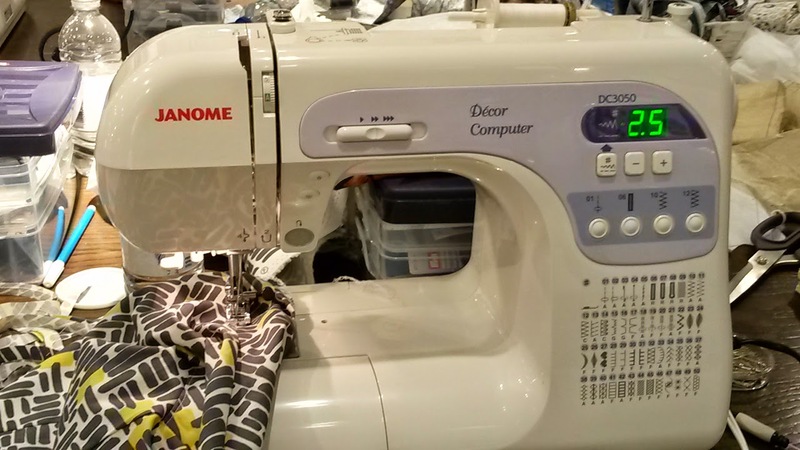 We each got to use a Janome DC3050, which was a really great machine. I would definitely recommend this if you're on the lookout for a mid-range computerised machine. Here's a few pictures to give you an idea of what went on! And here's my finished Betty in all her glory. If you're interested in this pattern, I have included my usual details of sizing and techniques etc at the end. Otherwise, meet Betty Bacteria! (Roisin and I named this fabric the bacteria dress as the bricks do kind of look like bacteria under a microscope!). During the Sewing Bee, I decided to cut a size 12 (slightly larger than my measurements) and reduce the fit. With Lisa's help, we adjusted the basted dress on the side seams and the shoulders, the latter being typical fitting alterations I make on commercial patterns. I also took in the back zip seam a fair bit, which helped produce that lovely fitting bodice and back neckline. I did manage to put in the zip and have a pretty much finished dress on the day, but when I got home I ripped it out and put in my preferred method of a handsewn lapped zipper. I used double thread coated in tailor's wax and a prick-stitch to attach the zip. I love the finish and the perfectly aligned waist seam. The neckline and armholes are finished by an all-in-one facing, which is then understitched to keep it in place. I finished the hem by overlocking the raw edge and then turning it up, easing in the fullness, and machine stitching. I took quite a bit off the hem as I prefer dresses to finish just above the knee. Betty Bacteria was worn to brunch today in Clerkenwell with my gorgeous friend Tania. To show just how fantastic this fabric is, these photos were taken AFTER I got home. So that's after a few hours of sitting in the sweaty hot sun sipping on a peach bellini. Hardly any creasing! Well done Betty Bacteria! So there you have it. 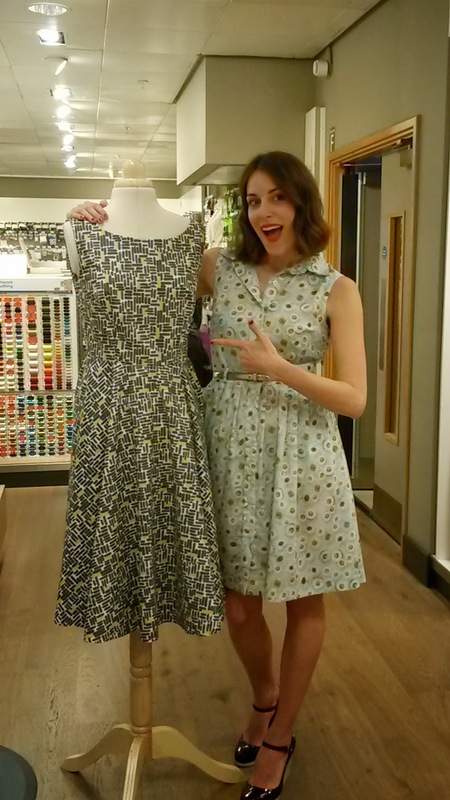 A fantastic sewing day plus a brand new dress for the summer. Massive thanks to John Lewis and Lisa Comfort and a big shout out to the other bloggers for making it such a fun experience.